LAKEVILLE, IN. 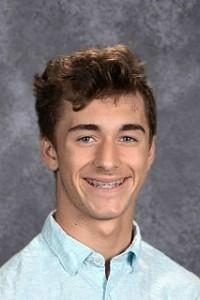 – LaVille sophomore Andrew Dill has been selected to the Indiana Football Coaches Association Class 1A Junior All-State Team. This team can include juniors, sophomores, or freshmen. “Making an all-state team is a result of two different things (1) a players ability and (2) a teams reputation and success – in other words a players teammates,” said LaVille football coach Will Hostrawser. “Both Riley and Andrew are exceptional talents in their respective roles. Both their recognition is very well deserved. Dill, a 5-foot-11, 185-pound wide receiver, led the Lancers with 26 catches, 644 yards, and a 24.8 average. He also had five TD catches with a long of 91 yards. “It is a great honor to be selected by the IFCA for this award,” said Dill. “I am very appreciative of all the hard work that my teammates have put in to help achieve this award. I plan on pushing my teammates and myself to get better. We also want to set our goals high. Great teams and great players don’t settle with where they are at and always strive to get better.